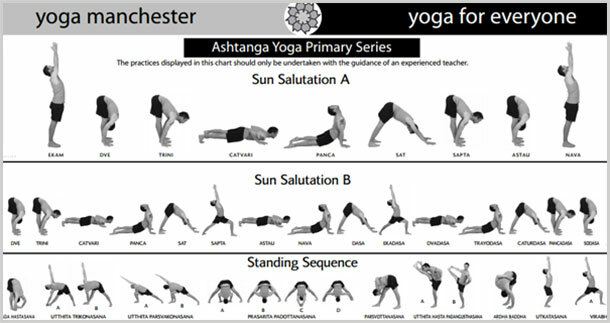 The Ashtanga Yoga system is broken down into six different sequences: Primary Series, Intermediate Series and Advanced A , B , C & D Series. The Primary Series referred to as ‘Yoga Chikitsa’ helps to re-align the skeleton and acts as a therapeutic practice. The Intermediate Series ‘Nadi Shodana’ helps to purify the body’s energy channels –the ‘nadis’ . Finally the Advanced sequences – ‘Sthira Bhaga’ – steady strength, helps to build higher levels of strength and flexibility. Guruji Pattabhis Jois would say that the advanced series should be used for demonstration purposes only. Click on the link below to download the charts for the Primary, Intermediate and Advanced A sequences. Please feel free to distribute amongst other yoga students.